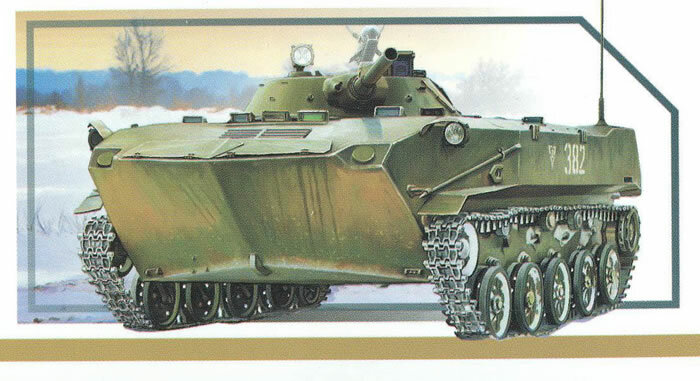 In the mid 1960s General Margelov, commanding general of the Soviet VDV or airborne troops, fell in love with the concept of the BMP and wanted a similar vehicle for the VDV to use for combat operations. A smaller and cutdown version of the vehicle, based on the unsuccessful Article 911 competitor for the BMP mission, was then produced as Article 915. After testing, it became the BMD-1 (combat vehicle air assault). It provided the same turret and firepower of the BMP-1 (73mm closed breech grenade launcher, 7.62mm PKT machine gun, and 9M14 Malyutka ATGM) but in a smaller and lighter chassis that carried only five paratroops. They could use their own machine guns via two ports on the front of the hull. The BMD-1 has been in service for many years and even enjoyed some foreign sales such as to Saddam’s Iraq. Most have now been upgraded to BMD-2 status with a new turret and other upgraded features. Prior to this both Eastern Express and Zvezda had released kits of the BMD-1 - the EE one came with etched brass but the Zvezda kit was the better of the two. With the release of this kit Panda has now taken over the lead. The model is cleanly molded and uses slide molding to provide a hollow bore for the 73mm gun. There is no interior at all and only minimal detail on the inner sides of the hatches which is a shame. The kit is of one of the standard or later production vehicles with the “starfish” like wheels and not the perforated ones of the early vehicles. There is no clear sprue with the kit so all lights are solid as are all viewers. Finishing and marking is provided for three different vehicles, all Soviet: bort number 382 (white); bort number 547 (white); and bort number 771 (white). Since Soviet airborne divisions had three regiments in each one the first one is probably from the 8th Company (3rd Battalion) of one, 547 is from the 4th Company (2nd Battalion), and 771 is from the 7th Company of the 3rd Battalion. A inverted triangle with a 2 inscribed in it is provided as well. These are all on a small decal sheet with the etched brass. Overall this is a nice little kit but the tracks will drive some strong men to drink. If you can replacement with an easier set it is mostly a simple kit to build.